1. Charles Banner suffers from early onset Alzheimer’s. Has anyone in your family or your group of friends been diagnosed with Alzheimer’s? What was the most difficult part of the illness for them? For you? 2. Twenty-three years ago Charles was convicted of a crime he didn’t commit. Do you believe current forensics have changed the number of unjust convictions or is prevailing public opinion as likely to provide a sentence as it has historically? 3. Charles and Misty Banner had a May/December romance. Do you believe relationships with wide age gaps can work out long-term? Have you seen any real life examples of successful May/December romances? 4. 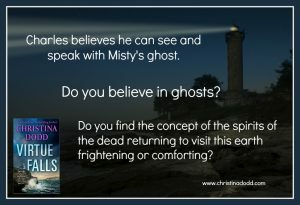 Charles believes he can see and speak with Misty’s ghost. Do you believe in ghosts? Do you find the concept of the spirits of the dead returning to visit this earth frightening or comforting? Do your feelings on the matter depend on your previous relationship with the deceased? 5. Charles believes that Elizabeth blamed him for not protecting her, for abandoning her as a child, even though in actuality he was in jail for a murder he did not commit. Are there any situations in your life where you have seen blame placed on a person who could not have controlled the outcome of the situation? How did the parties react? What was the eventual outcome? 6. In the finale, Charles overcomes age and Alzheimer’s to avenge Misty’s death and save his daughter, and that night he’s transported to the place where he was happiest on earth and he is with Misty. Do you believe in the afterlife? What is your idea of heaven? 1. For as long as she could remember, Elizabeth has been labeled, “The girl who saw her father kill her mother with the scissors.” Although the murder has influenced every aspect of her life, she was four when this event occurred and she does not remember it. “Childhood amnesia” is common to everyone and a person’s first memory is normally recorded between the ages of two and four. Does your family discuss things you did or said in your early life that you don’t recall? What is your first memory, and was it traumatic? Do you believe you remember the incident accurately? 2. Elizabeth is beautiful and voluptuous like her mother, yet lacks Misty’s intuitive understanding of people. Elizabeth also displays the same interests and intelligence as her father and is dedicated to the study of geology and the changes in the earth. All this despite being raised by her aunt and uncle who showed no intuition about how to handle her delicate emotional state and demonstrated no interest in the sciences. What do you think is the balance between nature and nurture? How much of our personalities/interests are formed by our DNA/parents/ancestors? Do you find family members comparing you to a relative you’ve never known? What is your reaction to the comparison? 3. When the earthquake hits, Elizabeth realizes that this is, “The earthquake she’d waited for all her life. And she was here to see it, feel it, experience it.” Have you survived a natural disaster, such as an earthquake, tornado, hurricane, volcanic eruption or tsunami? Were you fascinated like Elizabeth, quick-thinking like Rainbow, or screaming in fear like Dax (the Oceanview Café’s cook)? 4. Early in VIRTUE FALLS, Elizabeth notes that Garik never confided in her during their marriage, that even with him she felt alone. Have you felt this way in any of your relationships? How did you handle your feelings of loneliness? 5. When Elizabeth remembers her early relationship with Garik, she thinks, “When they first got together, she didn’t understand how two people who had so little in common could be so madly, passionately in love. And when they split, she realized madness and passion could never keep a couple together.” What does it take to create and maintain a successful union? What have you learned from your own failed or successful relationships? 6. When Garik at last confesses his past to Elizabeth, that his father abused him, he thinks, “He didn’t expect her to stick with him after this…now she knew how pathetic he really was.” This is typical victim thinking and one of the ways abusers keep their victims silent. Do you have a secret from your past that you keep from everyone, especially those who know you best? Do you fear a lack of understanding and the loss of love? If you have told your secret, how did it affect your relationship(s)? Discuss, if you feel comfortable in your surroundings. 7. Garik blames himself for the loss of a child, beaten to death by his vengeful parent. How would you have handled a suspect in a child abuse case? Would you have been able to maintain a professional demeanor? How does your opinion of Garik change knowing he gave in to a rage that resulted in so cruel a death? Does your opinion of him improve knowing his personal experiences, or do you believe his own experiences should have taught him to control himself and thus his actions are unforgiveable? 8. Garik has trouble understanding why Elizabeth enjoys geology so thoroughly. Have you felt this way about your significant other’s passions? Have you reached a level of understanding or does their enjoyment of their job/pastime still baffle or irritate you? 1. Multiple times the main characters mention Rainbow hanging out near important conversations and listening in. Does it bother you that Rainbow is a busybody or do you find her endearing? In your life, who is the biggest gossip? Do you get along with that person, or do you mistrust their interest in your affairs? 2. Margaret discusses the fact that she and her husband had a tumultuous marriage but stuck it out because of their Catholic upbringing. Do you believe in divorce as an option when a marriage isn’t going smoothly? If you have been divorced, what was the tipping point that ended the relationship? 3. Andrew Marrero fears being overshadowed by Elizabeth and tries desperately to keep her from releasing her video of the tsunami. In your professional life, have you ever felt that a manager or co-worker was purposefully holding you back? Were you able to develop your career regardless? What strategies would you suggest for those facing this type of situation? 4. Bradley and Vivian Hoff do a good deed by bringing publicity to the town of Virtue Falls, an action that focuses more attention on fixing infrastructure damage wrought by the earthquake. Do you blame them for using the plight of the town to build up Bradley’s reputation as an artist? Do you take issue with philanthropists who give only when it is to their advantage, or does the good they do outweigh the advantages they gain? 5. Kateri claims to have been killed by the Frog God and then reborn. Often we seek to explain natural disasters and their aftermath using religious stories (re: Noah and the flood.) What do you think of Kateri’s story? Do you believe in supernatural forces or do you fall on the side of pure science? 6. Who is your favorite of the Virtue Falls cast of background characters? Kateri Kwinault, Margaret Smith (proprietor of the Virtue Falls Resort), Rainbow (the waitress at the Oceanview Café), Ensign Luis Sánchez? Others? 7. In VIRTUE FALLS, the town itself is a character, shaping its inhabitants and their reactions to the earthquake. Do you feel the town of Virtue Falls has a distinct character formed by its location and isolation? What changes do you anticipate in the “personality” of the town post-earthquake? 8. The themes of the book are forgiveness, redemption and reunion, yet the story is explores the darker side of human psychology, including obsession, revenge and murderous rage. How did reading VIRTUE FALLS make you feel? Hopeful? Fearful? Do you believe reading about these themes enriched your life?